I first met Rosemary when she was teaching at a Dunedin high school and I was working in the role of attendance officer, truancy person, firstaider, student supporter ……. . As she was flying by on her way to a class or a meeting we’d sometimes swop a sentence or two about writing or poetry. When she sent me some of her stories and poems I immediately swooped on one for our Poems in the Waiting Room cards. I’m not going to divulge the title of her poem yet but it was one of the first poems to be selected by an artist. All our artists are working in the dark – that is, they don’t know whose poem they have chosen! One of my special places in Dunedin is the Regent Theatre. I love to be entertained – it could have been the Town Hall, Fortune … anywhere where I can be and have been transported to another place for a few dollars and a couple of hours at a time. To me the interior of the Regent is magical. 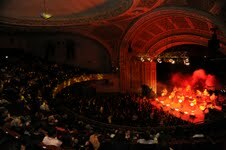 I love the curves and the ornate ceiling, the huge stage, the smell, the noise of the crowd, the lights, the sudden hush. Here’s a poem. I wrote this a couple of years ago, after a colleague told the story of her brother-in-law who overindulged on a night out with his mates some time after the birth of his first child. She called it his first pass out which I thought was prophetic in the circumstances. I know you asked for a photo of my writing place but I can’t as it’s in my head actually – I toss words around for ages before they get committed to writing and then any computer will do – sometimes at home, sometimes at work one phrase at a time while I am doing accounts or managing email or just staring out the window into my beautiful tree-filled view. I like poems that tell a story or capture a magical moment. Robert Frost is someone I enjoy, but to be honest I don’t read that much poetry. For me, poetry is a challenge – to find the right words to express a thought or feeling so that it can be revisited at a later time and still feel as fresh as when it popped into my head. This year I want to bring together my love of theatre, writing, history and a good story and to that end I am doing a play writing course in the second semester. We’ll catch up with Rosemary during the second semester, check out how the course is going and see if she has any more poems she’d like to share with us.